This $12.5 million project stretches from RM 652 to CR 232 and has already started construction. It is scheduled to be completed in Spring 2019. The work will rehabilitate 10.8 miles of road. It also installed a four-way stop condition at the intersection of RM 652 in Orla. Constructors Inc. of Carlsbad, N.M., won the project with a low bid of $12,525,496. Construction has begun on this $15 million project, which goes from CR 232 to SH 302. The project will add passing lanes and rehabilitate US 285. The project spans about 10.5 miles. The project started in December 2017 and is scheduled to take 19 months to be completed. FNF Construction of Tempe, Ariz., won the project with a low bid of $15,005,109.23. Scheduled to have a bid opening in May 2018, this project, which goes from SH 302 to FM 1216, has an estimated cost of $33.4 million. Scheduled to have a bid opening in April 2018, this project, which goes from RM 652 to the New Mexico state line, has an estimated cost of $33.5 million. 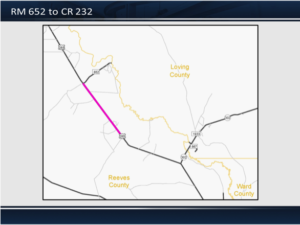 Scheduled to have a bid opening in July 2019, this project, which goes from RM 652 to CR 232, has an estimated cost of $8.5 million and would add more passing lanes and intersection improvements over a 10.8-mile stretch. 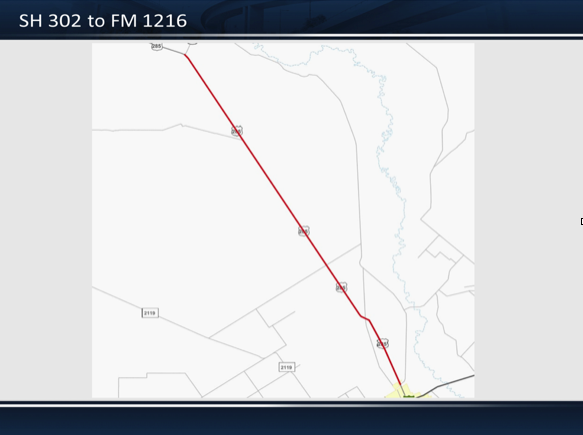 Construction will begin this summer on this $12.5 million project, which goes from US 285 to just east of East FM 1933. The project spans about 5.6 miles. The project is scheduled to take 15 months to be completed. Jones Brothers Dirt & Paving of Odessa won the project with a low bid of $12,502,318.48. 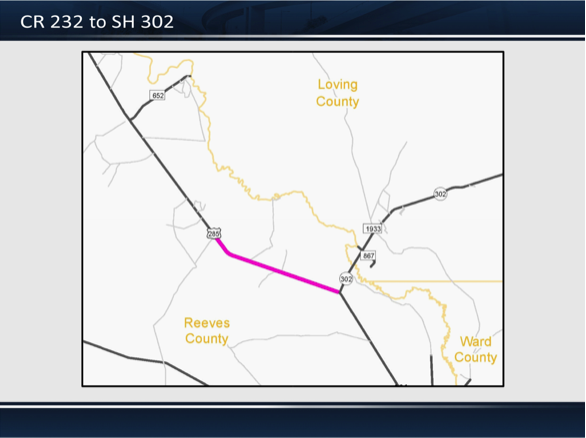 A Winkler County project from Loving County line to SH 115 opens bids in November 2019 at $20.6 million for roadway rehabilitation of 12.87 miles. 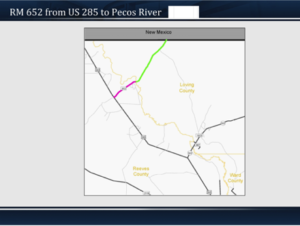 A Loving County project from FM 1933 to Winkler County line opens bids in September 2020 at $27.5 million for roadway rehabilitation of 17.2 miles. 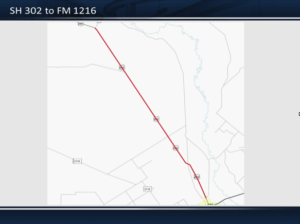 A project from County Road 313 in Winkler County to the Ector County Line opens bids in August 2021 at $9 million for lengthening existing passing lanes of 16.5 miles. A project to widen SH 302 to 4 lanes with a center turn lane adjacent to Black Mountain Sand facility at $2 million to be determined by ownership. This project is being done by Lesna Construction Inc., on a bid price of $3,793,865. Completion is expected by June 2018. Construction is nearly 40 percent complete on this project, which goes from US 285 to the Pecos River. The project spans about 5.6 miles. Constructors Inc. of Carlsbad, NM is the contractor. 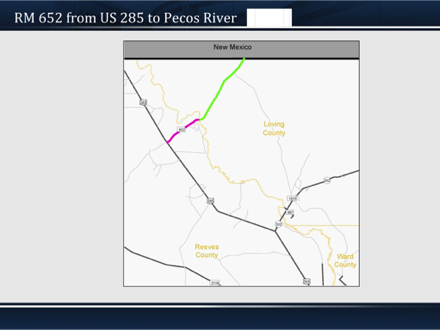 A Loving County project from the Pecos River to the New Mexico state line in June 2018 at $17 million for roadway rehabilitation of 11.3 miles. 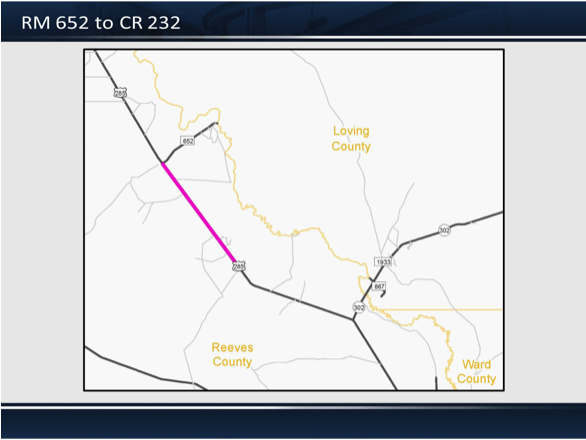 A Reeves County project from US 285 to the Culberson County line in February 2020 at $9.75 million for roadway rehabilitation of 7.8 miles.